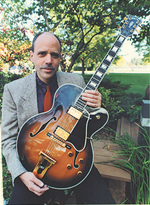 Jazz guitarist Roger Brotherhood teaches at The Guitar Studio and performs in the Madison, Milwaukee, Chicago, Minneapolis area. He’s available for bookings, either as a soloist or as leader of his duo, trio, or quartet, and for jazz improvisation clinics and workshops. The Guitar Studio is currently located in Wauwatosa (Milwaukee) WI, serving Brookfield, West Allis and Tosa, with an additional branch near the UW campus in Madison. Give us a call for lessons.